Have you ever been around 15 excited women who are dying to go fishing? If you haven’t, then you have no idea what you’re missing out on. It was time for our annual Ladies Only Fishing Trip. Jessica Cano always organizes a fabulous one with many generous sponsors. Several of the women were newcomers including Casey McLay, Charina Cobos, Denise Mace, Ginger Fawn, Lindsey Randlett, Rachel Von Fleck, Sunny Trent and Tracy Hartman. For the rest of us, Belinda Barnes, Donna Sanchez, Kelly Castaneda, Michelle Humphrey, Rica Hatch and myself, it was like a reunion. We were pumped and ready for the fishing shenanigans to begin. Before we even got on the boat, the Tuna War participants from the Tomahawk and Tribute, were getting back from their trip and were at the landing. Of course, we had to have pictures taken with the Wicked Tuna stars, Captain Dave Marciano and Captain Paul Hebert. This only created more excitement. Our adventure was to be an overnight on The Voyager with Captain Todd Myers at the helm. Todd and his crew, RJ and Chuck, were about to experience what many crews don’t get to. Fifteen lovely ladies who are biting at the bit to get out on the water and catch some fish. All of our tackle was ready to go and our first stop was to get bait. Once we arrived at the bait barge, a couple of ladies couldn’t wait any longer and decided to go fishing. Both Kelly and Tracy caught a nice halibut. A few of us tried to get one, but they were the only lucky two. Kelly was smiling ear to ear since this was her first legal halibut she ever caught. 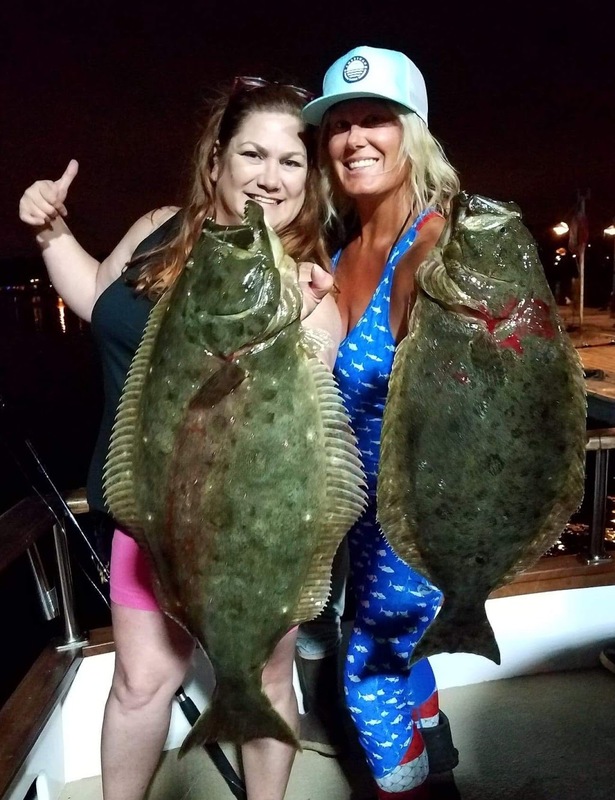 Tracy said, “I knew right from the start when we caught these halibut at the bait barge that it was going to be a great trip.” And it was the beginning of an epic trip. We headed to the Coronado Islands to catch some yellowtail and anything else that would bite. The Voyager arrived at 4:30am and several ladies got up to fish. They were calico fishing and it was off the hook. Every cast they caught a fish. “Waking up with these lassies at 4:30 in the morning next to the island catching bass until sunrise was my favorite part of the trip” said Donna. Hookup Baits, various plastics and sardines were what the bass were gorging themselves on. My first fish was a huge bonito caught on my Accurate Valiant 300 using sardines. I’m the kind of angler who tries everything just for fun when fishing because you never know what the fish will bite. I tried a surface iron and almost landed the fish except it spit the hook. Using a yoyo setup wasn’t a good choice. The fish didn’t bite it at all. The hot ticket seemed to be the live bait which were sardines and that was what I landed my jackpot fish on. I caught all my yellowtail on them as did most of the other ladies. The sea lions were in full force as we fished. 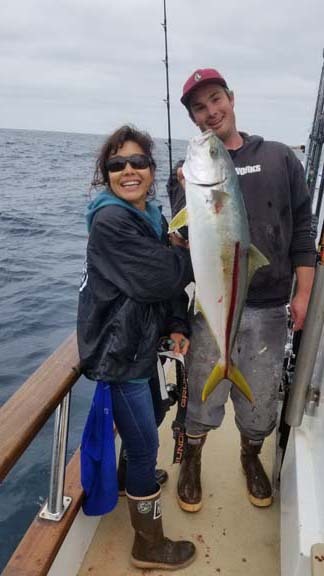 Jessica was hooked up with one of her many yellowtails and wouldn’t you know it, a seal lion tried to get it away from her. She fought hard for that fish and won. 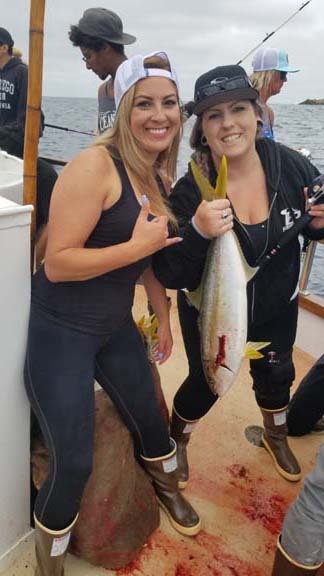 Jessica exclaimed, “When I got the yellowtail on the boat, there were no bite marks on it.” I didn’t get as lucky. The fish was at the boat with color and the deckhand tried to gaff it twice, but he missed both times. Out from under the boat in stealth mode, came a seal that must have been about 800lbs. He was the biggest one I think I’ve ever seen. He stole my fish and next thing you know my line is ripping off my reel. I stared at the deckhand in disbelief as I watched my line take off. The funny part is, I got all my line back and even the sliding sinker was there. The only thing missing was the hook. I hope it caused some pain to the seal’s stomach when he ate my fish. One thing about fishing with women is they encourage each other. If someone lost a fish, the others would say, “You’ll get them next time.” No one said anything negative about anyone or to anyone. We were there for each other no matter what. There were many levels of expertise on the boat, but we all did great and put the wood to the fish. 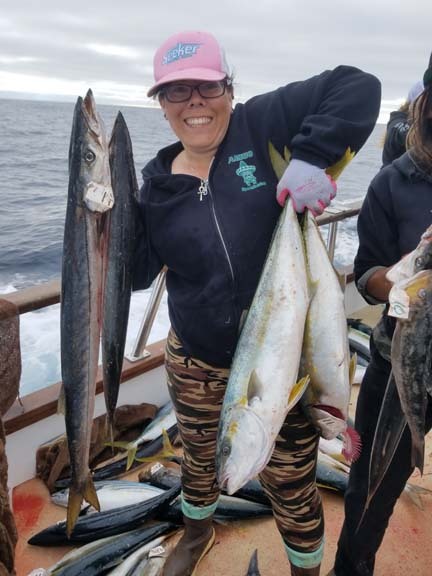 “Imagine my surprise when we got on some yellowtail and all the women fished well. At one point I was fighting a fish and I looked down the rail and saw 4 women on fish weaving over and under, working together, yelling ‘color’ all over the place and successfully landing them all” said Rachel. We kept the deckhands on their toes and they definitely earned their keep that day. We tried bass fishing again and it was a blast. 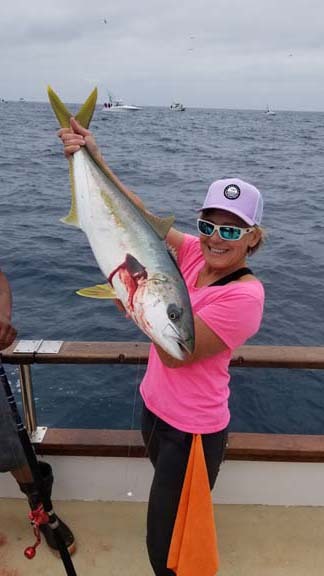 Denise caught her personal best on a flylined sardine. It weighed about 6lbs. Using the Hookup Baits plastic is my favorite method for catching bass. They just love them. I don’t even remember how many I caught using them. No one missed out on a chance to fish. We were on a mission to catch as many as possible. A funny thing happened to Ginger on the trip. She was fishing on the bow when she felt something poking her toe. She took off her boot, but didn’t see anything. She put it back on and the pain was even worse, then suddenly she saw a fish spine broken off in the top of her boot. At that exact moment, she landed a yellowtail. She threw her boot off and started winding it in on one foot while the deckhand worked to get the spine out. 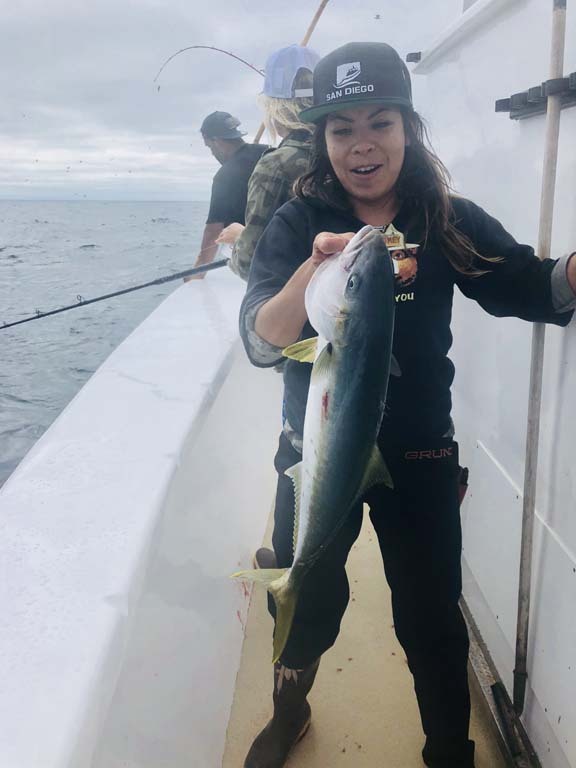 The deckhand got the boot back on her foot just in time for him to gaff her fish and this just happened to be the first yellowtail she ever caught. 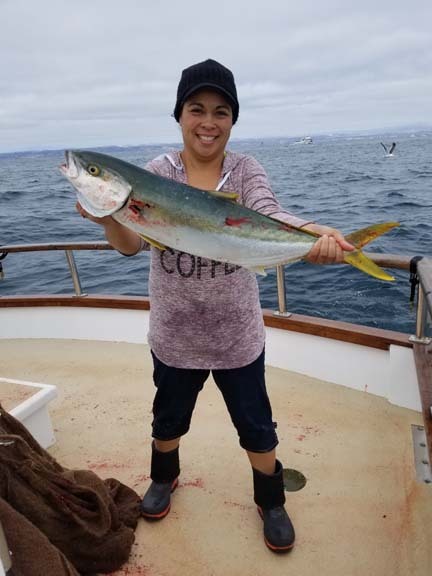 Jessica caught her limits of yellowtail by noon along with several other ladies. 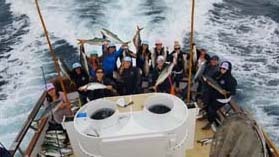 The total boat count was 75 yellowtail, 10 bonito, 12 barracuda, and 53 calico. 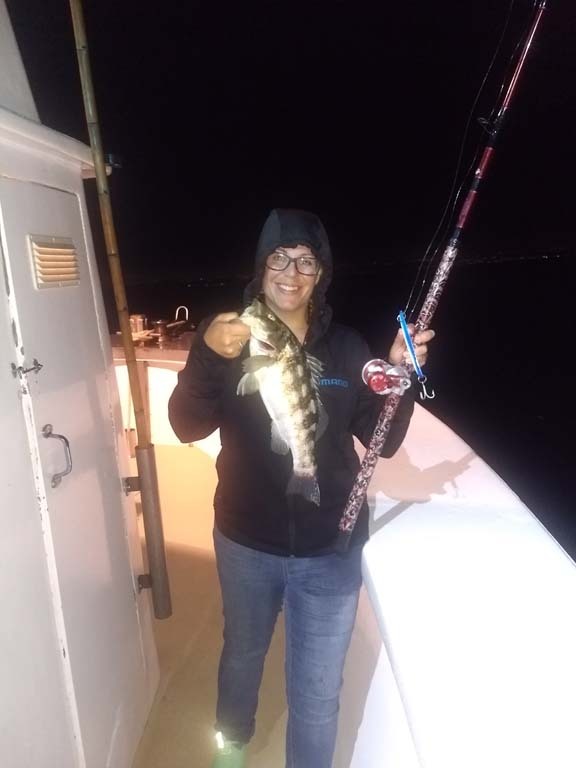 “No male drama and spending time fishing with like minded females takes fishing to the next level,” stated Rica and that makes fishing with women the best. There were frenzies and bloody decks, but Belinda enjoyed every minute as did I. “We all couldn’t be any more different, but we’re brought together by this cool hobby and lifestyle we all enjoy. We were there to help each other, and hype each other up” said Lindsey. 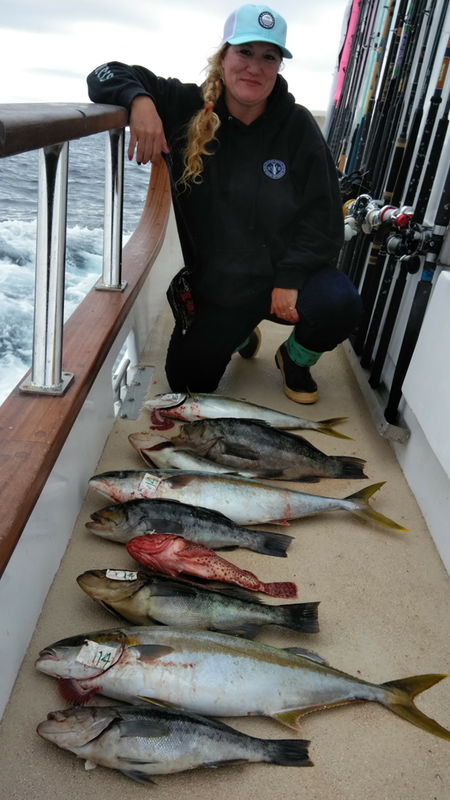 Jessica got some very generous sponsors for the trip including, Pacific Lures, XtraTufs, Pelagic, Ahcor, Bloodydecks, Aftco, Bluewave Jewelry, Lobster Port, LP Fishing Supply, Wicked Pliers, and Fishing Syndicate. Thank you very much for blessing us with so much! The trip was phenomenal, and I can’t wait for next year’s trip! Fishing with these beautiful ladies is the best. They are sweet, caring, confident and loving toward each other. You should try it sometime unless of course you’re a man.